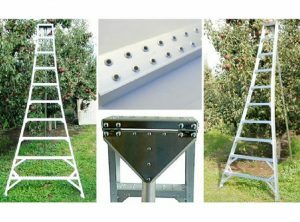 Aluminum Tripod Orchard and Landscaping Ladders are designed for orchard use and landscape maintenance, on turf or ground only. These ladders are lightweight and available in many sizes. They are preferred by growers and workers for their high quality slip-resistant steps.